As of yesterday they have gotten Rambo's breathing under control. As of yesterday they have started letting him "wake up". 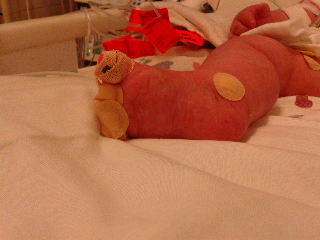 As of this morning he is off the nitric. As of today he has stopped getting the insulin drip. (The picture shows how his poor little toes have been abused- glucose tests every hour). As of tonight he is down to 30% oxygen. Vent pressures are still high. Today they went up a little on his heparin and down on the milrinone and dieuretics. Rambo you impress us all more every day with the power you draw upon to heal and become stronger. May you continue to be watched over always.